Just one story on the show today. Gary and buddies Dennis, Carl and Doug go for a hike and you’re invited to join them. They travel to the rugged Bay of Fundy coast in the province of New Brunswick in Atlantic Canada. 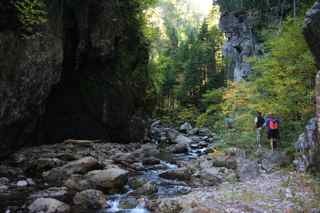 They hike to the mouth of the Little Salmon River and from there travel up river to another stream. Walking in the water with sandals on they continue through a narrow gorge with towering cliffs until they reach a spectacular waterfall. On the way they encounter deer and other wildlife and learn a little about the history of the area, all the while surrounded by the forest at the peak of fall foliage. Eventually they rejoin a trail that climbs up to an incredible lookout giving them a view of what’s called ‘The Grand Canyon of New Brunswick’. Enjoy some podsafe music along the trip by these artists: Justin Gordon, Andrew Pfaff, After Touch and Christopher Wright. 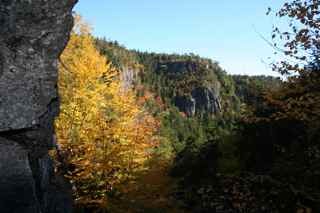 Find out more about the area on the following websites: Fundy Trail, Bay of Fundy Coast, Fundy Footpath. Be sure to check out the Doing Stuff Outdoors website for regular blog posts and subscribe to the podcast in iTunes . Call in your outdoor adventures and story ideas to the comments line at 206-600-4557 and email the show at doingstuffoutdoors@yahoo.ca. Next week on the podcast we’ll take you on another hike, this time in the Wind River Range of Wyoming.